Discover a portrait of a younger and more beautiful Mona Lisa that predated the famous Louvre masterpiece. In September 2012, headline news shook the art world. A secret da Vinci had been uncovered, a portrait of a younger and more beautiful Mona Lisa that predated the famous Louvre masterpiece. Now an elite group of art historians, research physicists, restoration experts and forensic imaging specialists have gained exclusive access to analyze the painting first hand. 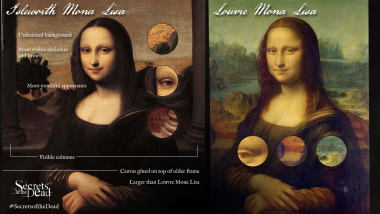 Applying high-precision, scientific techniques they will aim to verify the painting’s date, decipher hidden mathematical codes within it, and unravel the clues that point to da Vinci’s genuine hand. What Is The Isleworth Mona Lisa?